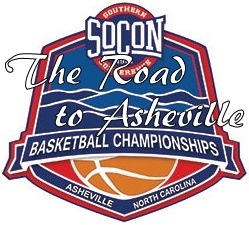 First round // Friday, March 3 // U.S. Cellular Center // Asheville, N.C. The Purple & Gold Player of the Game for Monday night's VMI contest is sophomore forward Marc Gosselin. Marc Gosselin picked up his fifth double-double of the season with a game high 20 points and 12 rebounds Monday night in Western's victory over VMI. He hit 7 of 8 field goals, and was 2 for 2 from the free throw line. Gisselin also had 4 steals. Purple & Gold congratulates Marc Gosselin on his selection. 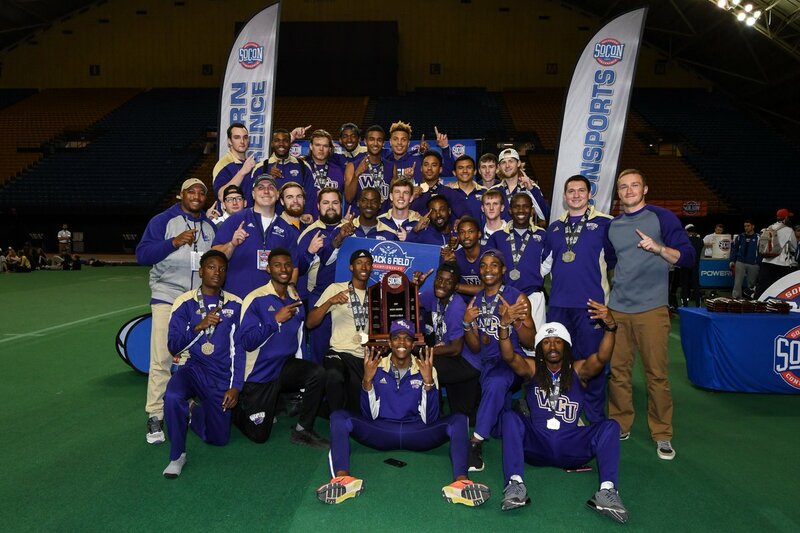 The Western Carolina Catamounts captured their fourth consecutive men’s Southern Conference Indoor Track and Field Championship, while WCU women's team earned second place Sunday at the Mountain States Health Alliance Athletics Center in Johnson City, Tennessee. The four teams competing on Friday's play-in round, will tip off at 5 pm, March 3. The two games scheduled in the play-in round are of course single elimination. 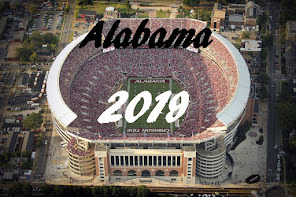 All games will be carried on ESPN3, except the championship game which will be on ESPN2. 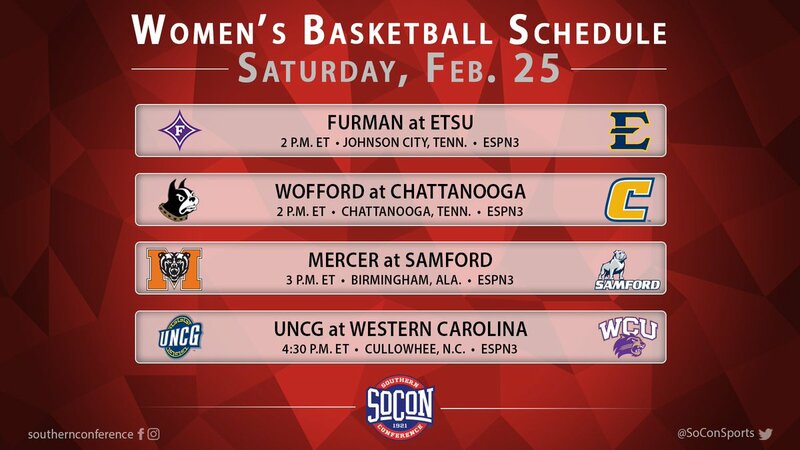 There's a full slate of conference games on Saturday, as the season winds down. 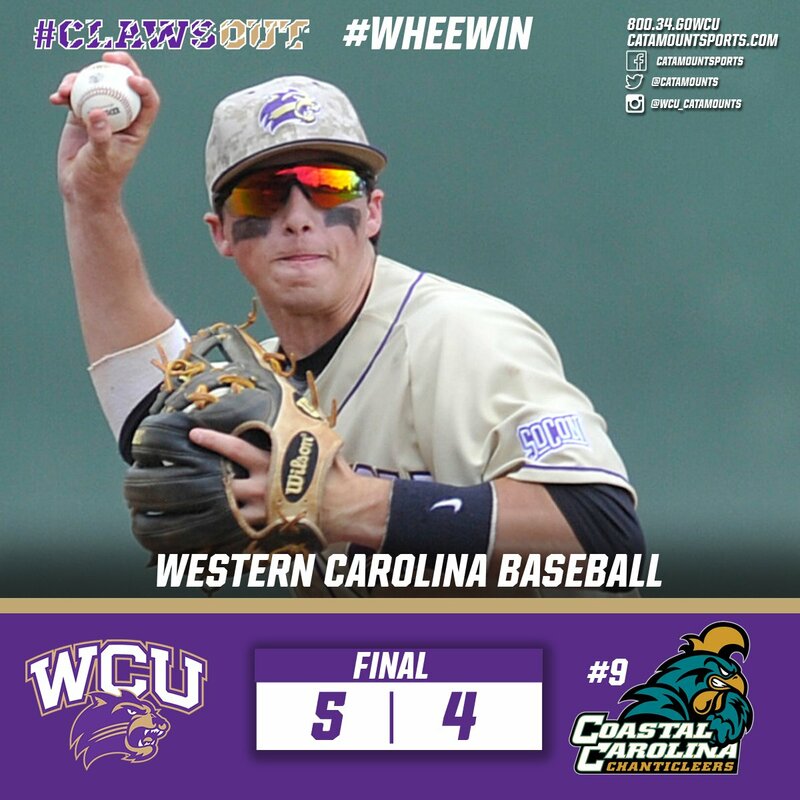 This will be senior day for the Catamounts, however the Cats will play again at home on Monday night. The Purple & Gold Player of the Game for Wednesday night's The Citadel contest is junior forward Ashley Williams. Williams came off the bench and hit a game high of 20 points, hitting 5 of 10 field goals, and 6 of 10 from the free throw line. Williams also had 1 assist and pulled down 2 rebounds. Purple & Gold congratulates Ashley Williams on his selection. There's a full slate of games on the schedule for tonight. The big game has #1 at #2, as the Paladins visit the Bucs in Johnson City. 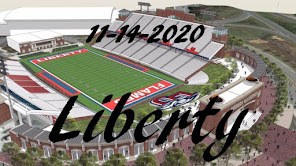 Freedom Hall Civic Center Johnson City, Tennessee - The Bucs are 7 point favorites. Western Carolina opens spring drills on Tuesday, Feb. 14. WCU's schedule includes five practices apiece on Tuesday and Thursday, two Friday sessions, and three Saturday practice dates. The VMI Keydets shot 61 percent from the floor in the second half and got 37 points from QJ Peterson, en route to a 101-78 win over The Citadel Bulldogs Saturday afternoon in Lexington, Va. The game was close at halftime, with just a one-point margin separating the teams, but VMI (6-17, 3-9 SoCon) blew the game open by starting the second half with a 25-8 run and The Citadel (9-18, 2-12) never seriously threatened again. 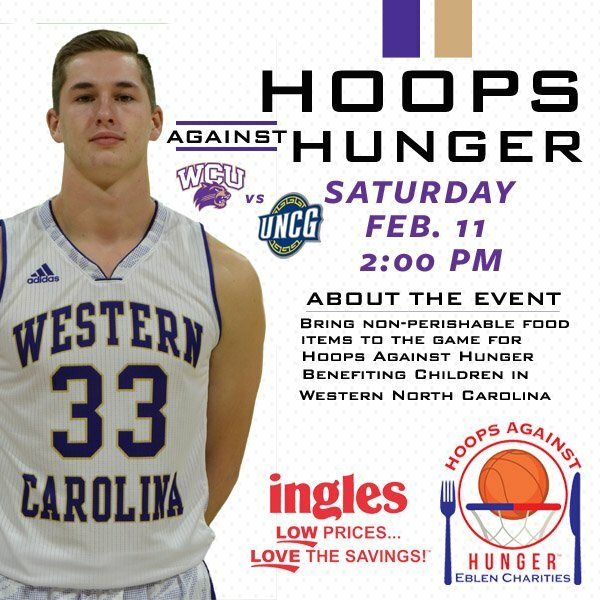 For the fist time since 2008 and just the fourth time in program history, the UNCG men’s basketball team left the Ramsey Center in Cullowhee with a win as the Spartans posted a 76-68 victory over hosting Western Carolina Saturday. The victory snapped an eight-game losing streak for the Spartans in Cullowhee, marking their first win since Feb. 21, 2008. 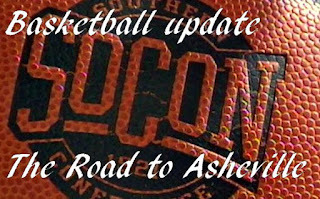 The victory improves the Spartans to 18-8 overall on the season and 9-4 in Southern Conference play. The 18 victories for the Spartans ranks sixth-best in program history and marks the most wins in a season since 2007-08. T.J. Cromer (Albany, Ga.) and A.J. Merriweather (Jackson, Tenn.) wasted little time reaching the 1,000-point milestone. The Buccaneer senior duo both reached their respective mark in the first four minutes of the contest as ETSU opened on a 22-8 run en route to downing Mercer, 88-71, in front of 5,225 fans on Saturday afternoon inside Freedom Hall.ETSU – who extended its home win streak to five straight games – improved to 20-6, 10-3 in Southern Conference play. The Bucs have now posted back-to-back 20-win seasons in the Steve Forbes era, marking the fourth time in program history ETSU has accomplished the feat in consecutive seasons. Junior John Davis III poured in a career-high 24 points and added four assists as Furman cruised past Samford, 90-73, Saturday at Timmons Arena in Greenville, S.C. With the win, the Paladins improve to 18-8 overall and 11-2 in the Southern Conference and maintain the lead in the SoCon standings. Furman extended its winning-streak to eight games and pushed its SoCon home winning streak to 16 games. The loss drops Samford to 15-11 overall and 6-7 in league play. Devin Sibley added 22 points on 7-of-14 shooting (5-8 from three), as well as a team-high six assists. Kris Acox and Daniel Fowler also scored in double-figures for the Paladins, with 17 and 16 points, respectively. The Paladins forced 21 Samford turnovers in the contest and outscored the Bulldogs 38-5 off turnovers. Furman shot 57.1% from the floor and 54.2% from three, while holding Samford to just 27.3% shooting from beyond the arc. The Wofford men's basketball team fell 73-65 to Chattanooga on Saturday night, ending the Terriers four game win streak. 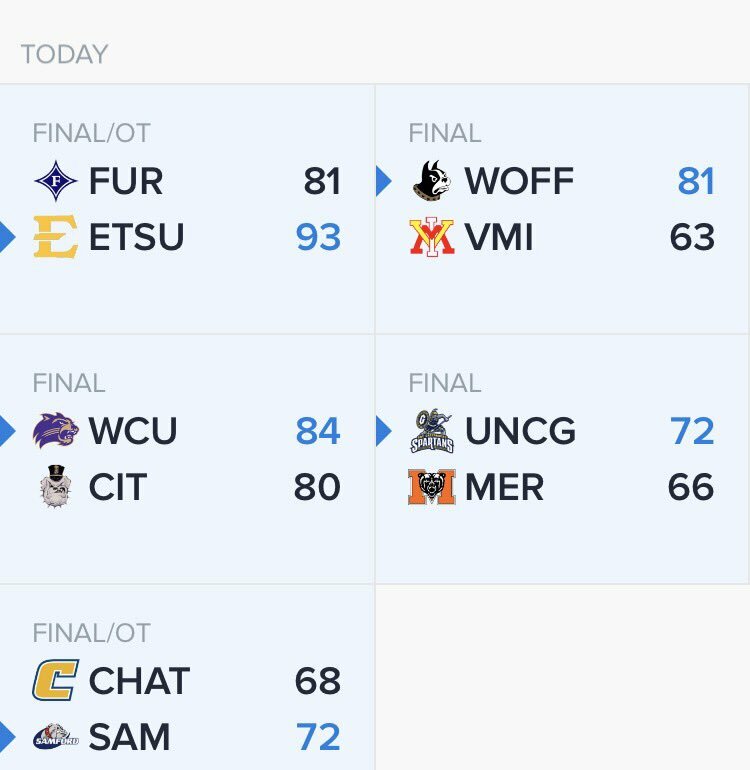 With the loss, Wofford falls to 13-14 on the season and 8-6 in Southern Conference play, while Chattanooga improves to 18-7 overall and 9-4 in conference action, sweeping the meetings between the two teams and handing Wofford just its second home loss of the season. The four teams competing on Friday for the play-in round, will tip off at 5 pm, March 3. The two games scheduled in the play-in round are of course single elimination. We have a full schedule of games today. Fletcher Magee scored a career-high 36 points and Eric Garcia tied a career high with 31 points and Wofford outlasted Samford 131-127 in a four-overtime thriller on Thursday night. Garcia's baseline 3 with 16 seconds left in the fourth overtime gave Wofford (13-13, 8-5 Southern Conference) a 128-127 lead. The Terriers made 3 of 4 free throws to seal it. Ria'n Holland had 18 points to lead five players in double figures as Mercer roared past VMI for an 81-51 victory on Thursday night. Holland was 7 of 14 from the field. Jordan Strawberry added 12 points while dishing out five assists to give him 300 assists in his career. Desmond Ringer, Demetre Rivers and Cory Kilby chipped in 10 apiece for Mercer (12-14, 6-7 Southern Conference), which has won four of the last six games. The Bears made 28 of 53 (53 percent) from the floor while limiting VMI to 19-of-57 (33 percent) shooting. The Bears also won the rebound battle 39-28. Coming off a tough three-point loss at Wofford on Monday, the ETSU men’s basketball team was in search of bouncing back into the win column. The Bucs did just that as four players scored in double figures – including a team-high 17-point effort by senior guard T.J. Cromer (Albany, Ga.) – as ETSU capped off the season sweep over The Citadel with a 90-69 victory on Thursday night inside Freedom Hall. Junior Devin Sibley scored a team-high 13 points and senior Kris Acox connected on the go-ahead basket with under seven seconds remaining to lift first place Furman to 60-56 victory over Chattanooga in Southern Conference men's basketball action on Thursday night at Timmons Arena. The victory, which improved the Paladins to 17-8 overall and 10-2 in SoCon play, extended Furman's winning streak to seven games and marked its 15th consecutive home triumph in SoCon action. Chattanooga fell to 17-7 overall and 8-4 in the league. After Daniel Fowler pulled Furman even at 56-56 with a pair of free throws with 1:48 remaining, each team committed a turnover on its next possession. With under a minute to play, Chattanooga's Johnathan Burroughs-Cook penetrated into the lane only to have his shot blocked by Sibley. Following a timeout, Fowler fed a pass to Acox, who connected on a jumper in the middle of the lane to give the Paladins a 58-56 lead. 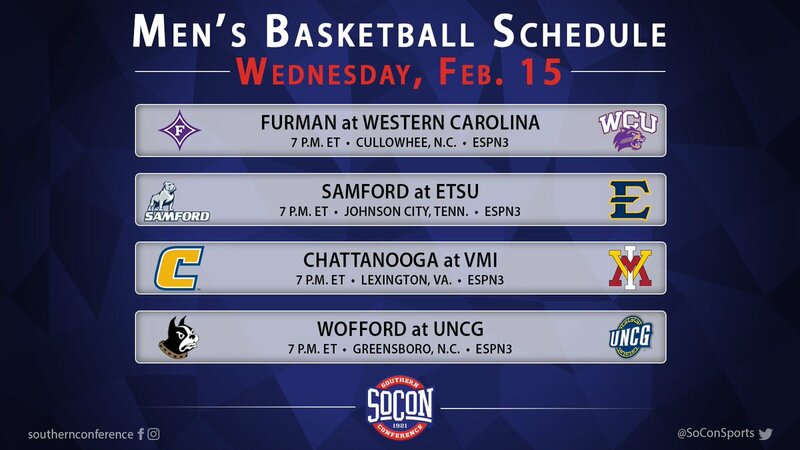 Four games are on the schedule for Thursday, Western & UNCG don't play again until Saturday. Only one game was on the schedule last night. The Wofford men's basketball team won its third consecutive game and second in a row by three points, downing ETSU 79-76 on Monday night in the Benjamin Johnson Arena. With the win, Wofford improves to 12-13 on the season and 7-5 in Southern Conference action, while ETSU falls to 18-6 overall and 8-3 in conference play. The Bucs came into the matchup second in the conference and with Wofford's win over Furman earlier in the season, the Terriers have now defeated the top two teams in the league. Wofford is a near perfect 9-1 at home this season. Junior Devin Sibley poured in a career-high 32 points and senior Kris Acox added 19 points and 11 rebounds to power Furman to a 99-91 victory over The Citadel on Saturday afternoon at McAlister Fieldhouse in Charleston, S.C. The victory improved first place Furman to 16-8 overall and 9-2 in the Southern Conference. It marked the Paladins' first six-game winning streak since December of 2001 and their first six-game winning streak in league play since the 1979-80 season. Sibley drained his first seven shots, including four from behind the three-point arc, to score 20 first half points. The Paladins shot 61.8% as a team in the opening 20 minutes to build a 57-40 advantage at the intermission. The UNCG men’s basketball team snapped a season-high three-game losing streak Saturday afternoon as the Spartans went into Birmingham, Ala., and grabbed an 81-75 victory over Samford at the Pete Hanna Center. The back-and-forth game featured 18 lead changes and was tied 11 different times as the two teams went toe-to-toe for the second time this season. The victory improves to the Spartans to 17-8 on the season and 8-4 in Southern Conference play, keeping UNCG alone in fourth place overall. The 17 victories for the Spartans marks the seventh-most wins in program history and the most wins since notching 18 victories in the 2004-05 season. The win also improved the Spartans to 4-2 on the road in SoCon play, their most road wins in league action since the 2011-12 season (four road wins). Eric Garcia hit a three pointer with 1.8 seconds to go in the game and propelled the Wofford men's basketball team to a 65-62 win over Mercer on Saturday afternoon. With the win, Wofford improves to 11-13 overall and 6-5 in the Southern Conference, while Mercer falls to 11-14 on the season and 5-7 in conference action. 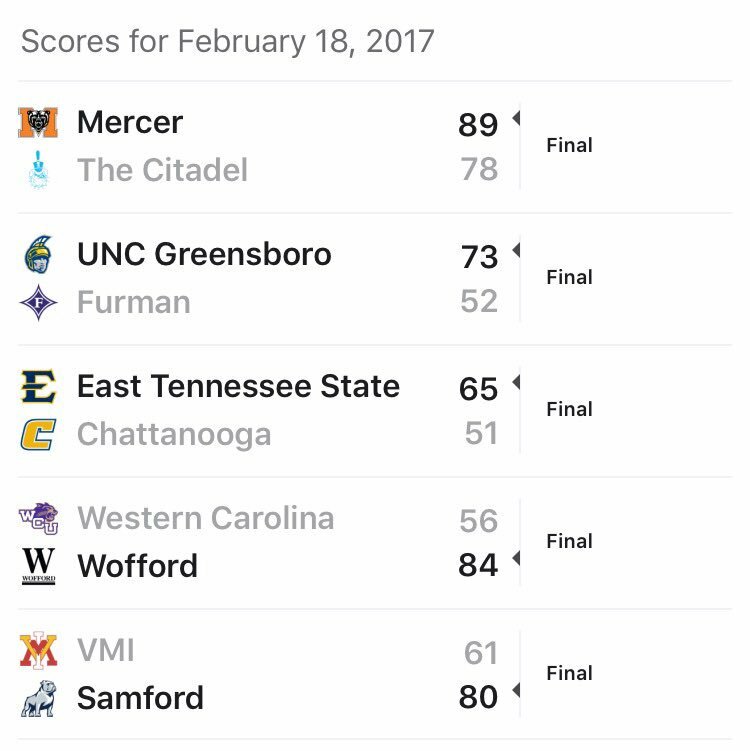 Wofford swept Mercer this season and won back to back road conference games for the first time since Feb. 26-28, 2015 when The Terriers defeated Mercer and Furman. The win also gives Young 243 career wins, tied for second most career wins by a Southern Conference coach with Mack McCarthy of Chattanooga (1985-1997) and Burton Shipley of Maryland (1923-1947). -Casey Jones' game-high 19 points led four Chattanooga Mocs in double figures in a 77-65 win over visiting Western Carolina Saturday evening. It was needed to hold off the hot-shooting Catamounts. Western took a 44-42 lead on Devin Peterson's jumper with just over 14 minutes remaining in the contest. The Mocs answered with a 10-2 run to flip the advantage to 52-46 for the Gig City lads after Justin Tuoyo's layup on a nice Jones feed. Chattanooga's defense limited the Cats to one field goal over four-plus minutes to take control.